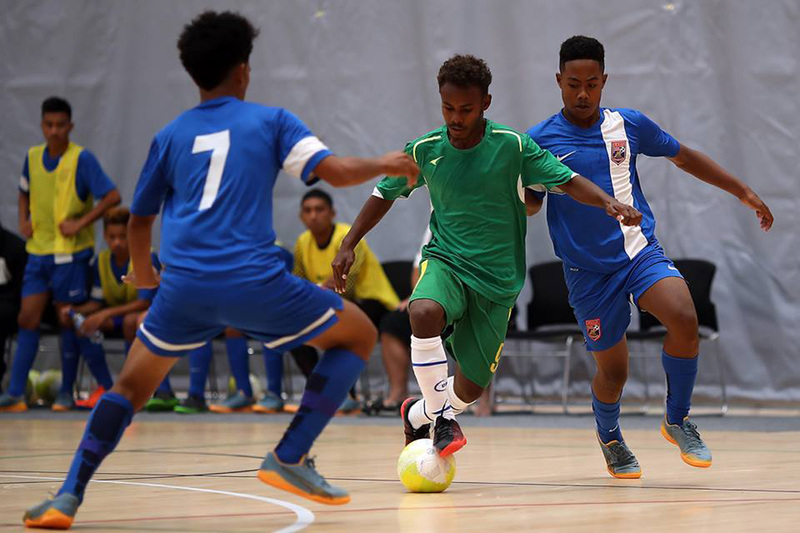 Solomon Islands have wrapped up an exciting day of action with an impressive 6-1 win over New Zealand in their second match of Day 1 at the OFC Youth Futsal Tournament at Bruce Pulman Arena in Auckland, New Zealand today. After securing an massive 18-0 win over American Samoa in their earlier match to place them top of the table, Solomon Islands coach Stanley Puairana was overjoyed with the successful start to his aspiring Kurukurus’ campaigns. “We are all very excited,” he said. Although he was disappointed with the loss, New Zealand coach Marvin Eakins credited Solomon Islands for their tough challenge and is determined to stay competitive throughout the tournament. “We started well against Tonga, got our confidence up and scored some goals but we knew Solomon Islands were going to be a tough game. They’re a futsal powerhouse and it’s great to see the youth they’ve got coming through,” he said. New Caledonia had a successful day on the court securing two wins to place them on the same points as Solomon Islands and coach Vincent Vasapolli was overjoyed to see such a strong pair of performances after only one month of preparation. “We were very good. We have only had one month of work together and it was fantastic for us. Two games and two victories – it’s perfect for us. We are playing Solomon tomorrow so these wins will hopefully be good for our confidence and mentality,” he said. Tonga were unfortunate to miss out on points in their first two games but coach Soane Mailangi was pleased with the effort displayed by the team and is excited to return to the court tomorrow. “I want firstly thank both teams for such good games and thank my team for their good performance. We lost both games but this is our first time playing futsal. We’re upset but we need to keep focus on developing our players,” he said. Vanuatu had a tough start adjusting to new playing conditions while trying to hold out New Caledonia but lifted in their second match against Samoa and were unlucky not to find the net more than six times throughout the game. Vanuatu coach Richard Lehi was relieved to get points on the ladder but hopes to see further improvement from his side in tomorrows fixtures. “Our performance was good today but our finishing was not what we expected. Maybe it was because of the surface – we are used to training on concrete. This is our first game here and we had to adjust to the surface,” he said. The Samoa men’s team finished the day with only one game under their belts but coach Horst Petana was overjoyed with the strong battle they gave against an agile and talented Vanuatu side. “I’m very excited about how the boys played. They did well given that we didn’t have much time to prepare but yeah, I was really excited,” he said. American Samoa also only played one match but coach Tunoa Lui was well aware of the tough challenge Solomon Islands would bring and was pleased with the effort put in by his far less experienced side. “We knew from the very beginning that the game was going to be a very tough task for us because we know that Solomon Islands are the number one team. For some reason our boys lost focus but I give credit to our boys – they played their hearts out and they did well but they made a lot of mistakes that cost us goals,” he said. Earlier in the day, New Zealand secured the top spot on the women’s ladder with six points after two strong wins against Tonga and Samoa. New Zealand coach Ronan Naicker was pleased with the first day of action but is focusing on recovery after two physical encounters. “We’re obviously happy with the results. We scored a few goals, there are a few things to work on but you can only be happy with two wins. We’ve got a few injury concerns – some possible concussions – so now it’s all about rest and managing recovery against the Auckland team tomorrow,” he said. Samoa started strong with a 4-2 over AFF Futsal but New Zealand proved too strong in their second match. Although he was disappointed to see his players drop their heads, Samoa coach Valario Raccuglia was impressed with the effort shown by his fresh-faced squad. “I’m happy. We only had five sessions together so I think we’ve done better than I expected. We’ve got a lot of talent and we’ve got a lot of good players so we just have to keep working,” he said. With one point on the table after defending AFF Futsal to a 2-2 draw, Tonga coach Manu Tualau was satisfied with the day, especially considering his team was drawn against tournament favourites New Zealand in their regional futsal debut. “I’m happy with the performance today and I’m proud of the girls. I didn’t expect the first game to have that small a score from New Zealand but we managed to keep it down. I know they gave it their best and I’m so proud,” he said. Invitational team AFF Futsal held their own in both encounters of Day 1, keeping a close margin in their loss to Samoa and battling Tonga to a draw in their final game. Coach Maxine Cooper was pleased with the teams improvement throughout the day and is looking forward to seeing further development throughout the rest of their games. “We improved so much as the day went on. They took everything that was said on board and by the end of the last game, they were playing awesome futsal. There was a massive improvement throughout the day so I’m excited to see how the next few days go,” she said.